Five photos remembering the Cunard liner, torpedoed in 1915 with enormous loss of life. German Lusitania commemoration medallion, National Maritime Museum, Greenwich, 27 January 2015. U-20 torpedoed the Cunard liner Lusitania off southern Ireland on 7 May 1915, killing 1201 passengers and crew. 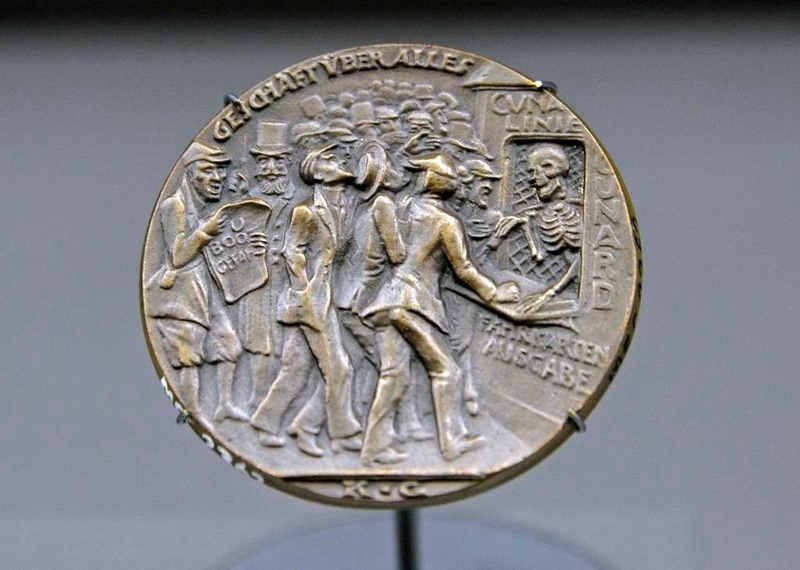 A satirical German medallist produced this medallion to blame the British for the sinking. Under a slogan meaning 'Business above all' Death sells tickets from the Cunard office as passengers ignore the U-boat warning ('U boot gefahr') posted by the Germans at the time of Lusitania's sailing from New York. British naval intelligence made 300,000 slightly modified copies of the medallion for propaganda purposes.